A web-based scaffolding Geographic Information Systems (GIS) strategy will bring a collaborative learning/teaching context for higher education research, and also will bring learning outcomes and interactive effects for architecture, urban and landscape design students in a distributed design environment. In a recent paper by Dr. Jin Su Jeong and Dr. David Gonzalez-Gomez, the newest approach about web-scaffolding learning/teaching model has introduced for architecture, urban and landscape design students with a case study Hervas (Spain), with GIS spatial planning analysis together with AHP/MCDA methodologies. "In higher education research, computer and information, especially World Wide Web (WWW), are getting increasing attentions. Considering current situations, a web-scaffolding learning/teaching model will help students to fill the gap of traditional learning/teaching system and to satisfy different requirements, which not reaching to the desirable outcomes", the lead author Jeong said. In the paper, the authors presented that a digital-based scaffolding GIS teaching/learning strategy can support architecture, urban and landscape design students'spatial planning in a distributed design environment, especially for suitable site selection of rural buildings as an approach in higher education research. They investigated the measurement and verification of the strategy proposed, which can support architecture, urban and landscape design students to have more understanding of spatial planning in a collaborative learning context while having communication with teachers and/or experts. They said that a case study area (Hervas, Spain) was used because of high scenic, biological and recreational value, which are tourists' attraction, and turned the region for the place increasingly destined for weekend residence. Besides, rural buildings' developments amplified together with significantly increased constructions of rural houses and new hotels during the last decades. They said that the research represented the proposed model in order to introduce new spatial planning potentials, starting from site analysis, other than what are currently used in the field of higher education research. It was to enhance meta-cognitive consciousness and as well as knowledge achievement with respect to spatial planning processes in a dispersed design environment. Also, it was to satisfy a mix of students with different needs in a collaborative learning project context. 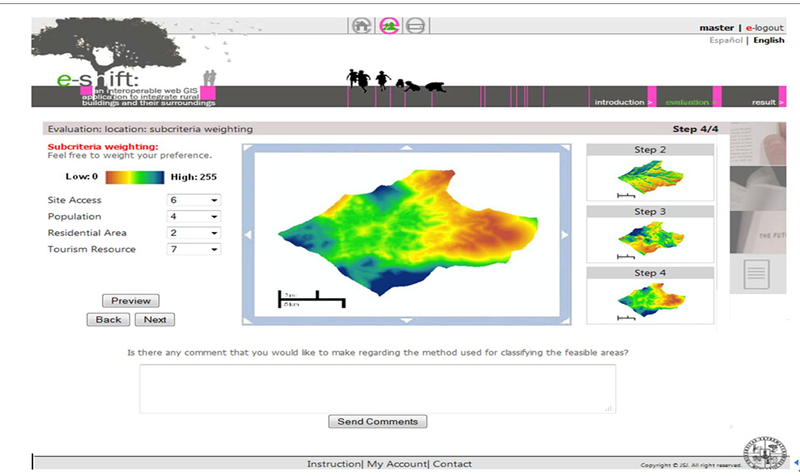 The research completed to firm results of the web-based scaffolding GIS teaching/learning tool use in the design studio, and moved further to open new research topics and venues. Dr. Jin Su Jeong, Department of Science and Mathematics Education, Training Teaching School, University of Extremadura, Caceres, Spain. Dr. David Gonzalez-Gomez, Department of Science and Mathematics Education, Training Teaching School, University of Extremadura, Caceres, Spain. A paper about the study appeared recently in Higher Education Research.